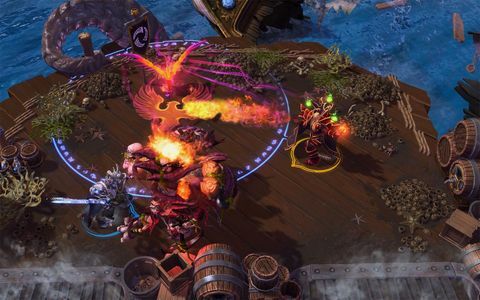 On the eve of Heroes of the Storm’s launch, we sat down with the game’s technical director Alan Dabiri and executive producer Chris Sigaty to discuss Blizzard’s plans for conquering the MOBA genre. 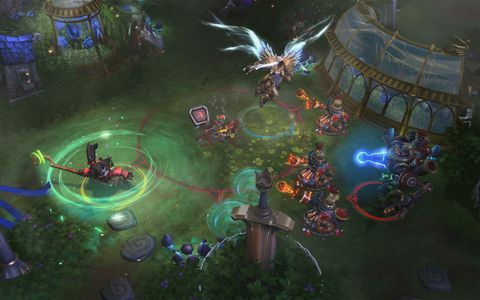 Q: What distinguishes Heroes of the Storm from LOL, Dota, Heroes of Newerth, and so forth? 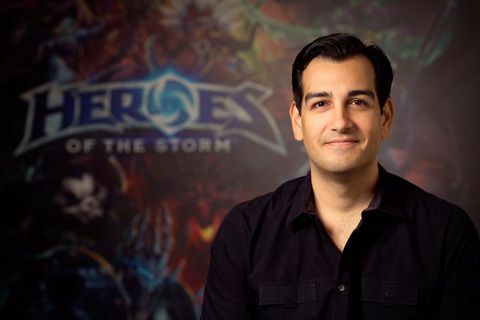 Chris: One of the most important parts of developing Heroes of the Storm for us was ensuring we were doing our take on bringing Blizzard’s heroes to competitive play – we spent a lot of time trying our best to set it apart. There are some critical core design philosophies in there, the primary being that it’s a shared team experience. All players level at the same rate, and your team is being successful or unsuccessful together. One of the secondary design goals was around how your heroes became more powerful in the game, so there are talents that you earn as you play, and you pick which talents you feel would work best within the context of that particular game. That’s a little different from what we’ve seen from other games that tend to be item-based. The final thing is the battlegrounds themselves. We spent a lot of time trying to create a tone of expect the unexpected, and our battlegrounds are probably the best example of that. As you play game to game, you’re always in a different playing field, which adds up to different opportunities and different ways you need to use your favorite heroes. 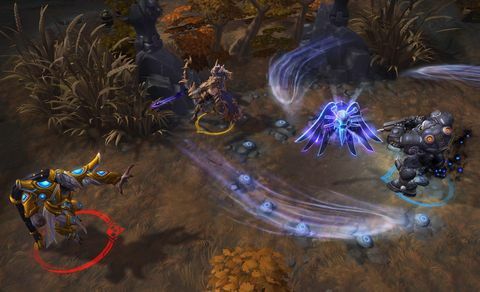 We feel like that’s created a very Blizzard-like experience and a very unique experience specific to Heroes of the Storm. Alan: Thing like team levelling and per hero talents really mean we can go a little crazy with some of the way that our heroes work. We can do unique and diverse heroes in addition to the diverse battlegrounds. Simple support classes might be difficult to play in other games because you’re not getting all the kills, and as a result you’re not getting more powerful. With the team levelling, we can have a hero that’s dedicated to supporting, and it doesn’t feel like they’re letting their team down – they’re actively contributing to the team. Chris: This game evolved over a pretty long period of time for us. We started really just making a mod for StarCraft II to demonstrate the power of the editor, and it developed into a full-blown Blizzard game as a result. The core philosophies developed over time with our community via BlizzCon, through interaction with the community. We’ve been a lot more out there in discussion and play with the community that we have in the past. 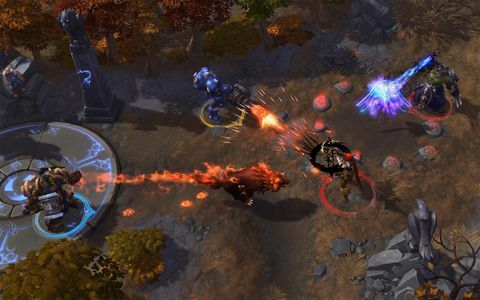 Q: How has the core vision for the game changed since it was known as Blizzard Dota? 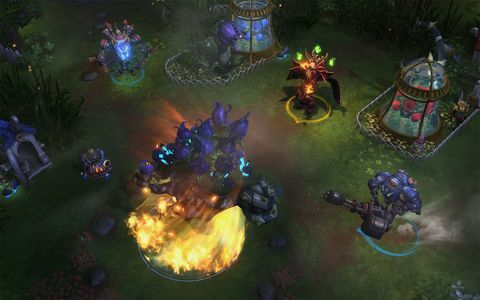 Chris: The biggest one is it did start a lot more similar to what was available in the MOBA genre. We had a lot of the same things. We knew we wanted to remove items but didn’t know how that would play out. Alan: We had an item shop, even the battleground idea – maps with different objectives – came over time as well. We had the standard three lane maps and it left us wanting more. That’s where the idea of introducing all these cool varied mechanics came from, so the play experience is always changing. Q: Blizzard’s name recognition and IP will pull players of those games in, but how will you retain them? Players have social networks built elsewhere, for example. Chris: We think it is all about friendships. I’m experiencing this myself. I look online to see if my friends are playing. There’s things in the game that encourage you to play with friends – bonus XP and gold. There’s no particular social attack or plan. Alan: We have some features that are planned for the future, like StarCraft has groups and clans – we’d like to bring that to Heroes as well. 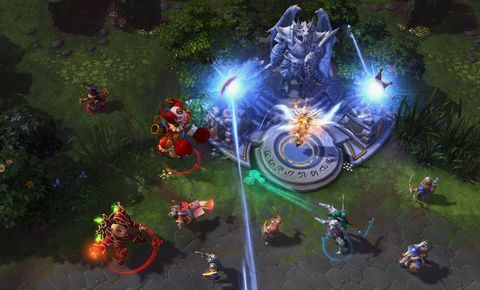 Q: Although Blizzard has an enviable stable of IP, there are a limited number of heroes it can import into Heroes of the Storm. How will you tackle this? Chris: We’re not targeting a number. We don’t look at it and go, “when we get to 50 we’ve reached success”. We feel like we do need to improve the [release] pace – the last couple of releases we were spending a lot of time on polish as we were getting ready for launch, so we didn’t have the release cadence we wanted. You’ll see that increase dramatically as we hit launch and go out the rest of the year. But there’s not a specific end goal. We feel great about the worlds we’ve created [at Blizzard], and how much we have to pull from. Alan: Speaking to the stable of heroes to pull from, the list is just incredible. The list goes on forever. I’d be amazed if we ever ran out of heroes and villains to put in the game. Chris: And it’s a Blizzard train that’s ongoing. 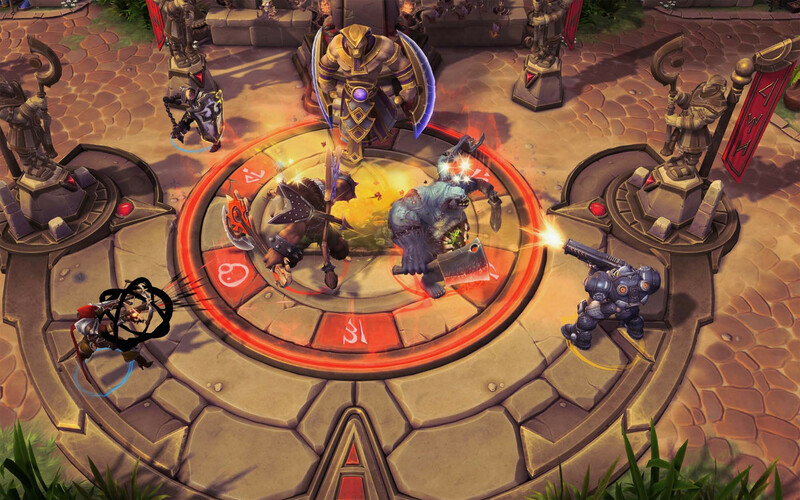 All sorts of news is coming out from our other games, so it’s an opportunity for heroes to pull from that as well. No announcement here, but we’re looking at a game like Overwatch that’s coming, Hearthstone can add new heroes, World of Warcraft is constantly ongoing, we have Legacy of the Void…new developments there all come back to Heroes. 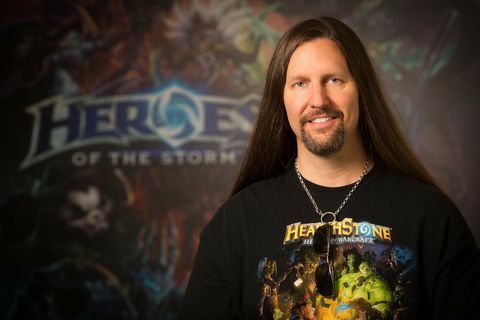 Q: Blizzard has been a PC developer since StarCraft, with the exception of Diablo III. 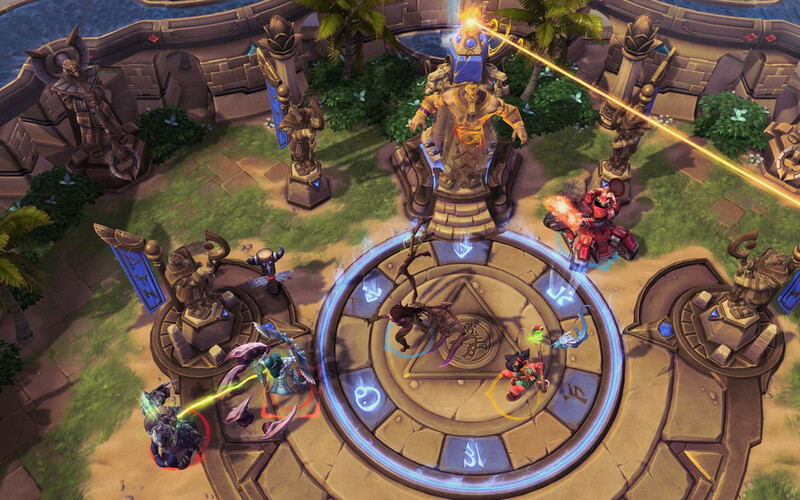 Could Heroes of the Storm ever come to console? Chris: We’ve talked about it. There’s some challenges there. It’s feasible, but it would be a different game, it would take a lot of changes. There’s nothing that prevents us from exploring it, but it’s not something we’re ready to commit to. We feel like this kick-off on PC and Mac and the amount of attention we need – we’re still hiring for core content. If we catch up there we might explore it, but for now we’re committed to PC/Mac. Q: Riot has struggled with abusive players. What is Blizzard doing to combat the torrents of verbal/text abuse that one may receive? Alan: This is definitely something we’re interested in – that everyone has a good time playing the game and that they don’t feel like they’re being attacked by people. There’s several things we’re doing, and things we wanna do in the future. Probably the first thing we’ve done is from the game design itself. Earlier we talked about things we changed. A lot of things we changed were focused on making this game more open to players and less likely you’re going to be attacked. Things like team levelling. Those aside, there’s always people that want to create a negative environment, and so there’s a lot of things we’ve been doing lately. One is we have a way to mute and block players. The other option is you can report them. We’ve got a great customer service team that will action those players – we’re doing this right now in fact. If people are acting in a way that’s inappropriate, we will take action on them by various means, from stopping their ability to chat to outright removing them from the game. Couple of other things: we’ve got a good ping system in the game that allows you to communicate with players. You can mute all allies and communicate purely through the ping system. Things start to break down as soon as people are chatting – “Why aren’t you doing this? Why didn’t you do this?” – and that’s something you can pretty successfully avoided in the game today. Chris: Beyond all that, we’re working on future improvements as well. This topic is really an ongoing thing. I don’t think it’s something where you do something and you solve it. We know it’s critical. Alan: The last thing I would add is if you go through the evolution of how the game steers you, you evolve finally into the versus modes. The biggest challenge I think is if you’re thrown into the deep end too soon, so that logical evolution helps keep things less toxic in my experience. Q: One of the biggest problems with Dota that causes toxicity is getting stuck in poor matchups. Does Blizzard have any strategies to ensure decent matchups, without locking players into a 30 minute foregone conclusion? Alan: I wanna hit that from two directions. Firstly, I wanna talk about foregone conclusions. I think people who come from different games, if a bad event happens early on, there’s this feeling that it’s over, and this is one of the great things about Heroes – it is absolutely not over. This game is designed in such a way, with various things that through coordination you can pull off, that really until your core gets taken down the game is not over. People that play Heroes more start to understand that – that it’s a game of comebacks. The other benefit is our games are much shorter – on average 20 minutes – so there’s not a huge amount at stake for you to try it out. Other games can go for 45 minutes or an hour, and you feel like you’re drained at the end. This is why we’re purposefully not putting in any surrender option – because we think that right now it would be unfair to the game. So many people are coming in now with these pre-existing notions of what it means to be behind, that there would be too many games killed off early, and that would in fact create more toxicity. So, we’re pretty adamant we won’t add a surrender option. On the other half about matchmaking, absolutely, we recognise that getting the right team together is pretty important for the game. Like combatting toxicity, matchmaking is this ongoing thing. In quick match, if you show up with less than five it’s in the matchmaker’s hands. So we keep monitoring, what are the trends and the best thing to do for team composition. We don’t wanna force things too hard because one of the things we really like is we’re not telling you what the meta is. We’re not saying, “Oh no you must play with this number of support”. Ultimately whatever we say is wrong. The players prove us wrong ‘cos they do some amazing plays with crazy matchups – five specialists or something like that. But there are some areas were it does help to have certain things on your team, so we look at these stats and one of the changes we just made was we noticed if you did not have a support on your team and the opposing team did have a support, they get a slight advantage and win more often. We thought “this is compelling enough that we wanna make a change here”. We changed the matchmaker so if you don’t have a support, you won‘t be matched with a team that does. It’s been a very positive change that’s been well-received by the community, and the numbers are looking a lot better as well. The nice things about matchmaking is we’re going to keep making improvements. It’s all server-side as well, so you don’t have wait for updates. Q: Why do you continue to exclude New Zealand from your giveaways? Chris: Is that a thing? We’ll definitely get back to you about that, it’s discouraging to hear that we’re excluding any region. We don’t wanna be in a situation where people would believe we would not wanna include New Zealand, one of the greatest places on the planet! Q: Now that we have dedicated Oceanic servers, can we expect to have maintenance outside our prime playing time? Alan: This is something that’s a real concern for us, and to be honest what we’re trying to do is get rid of maintenance times. There’s a bit of legacy there starting with World of Warcraft, and there are things that we do – we deployed a couple of patches recently where we had no downtime at all. We’re getting to the point where we’re releasing client patches without kicking people off the service, they’ll actually able to patch up and restart and get right back into the game. We recognize it’s a concern and it’s something we want to continue working on. Chris: Heroes is here for everybody and it’s a big deal for us. 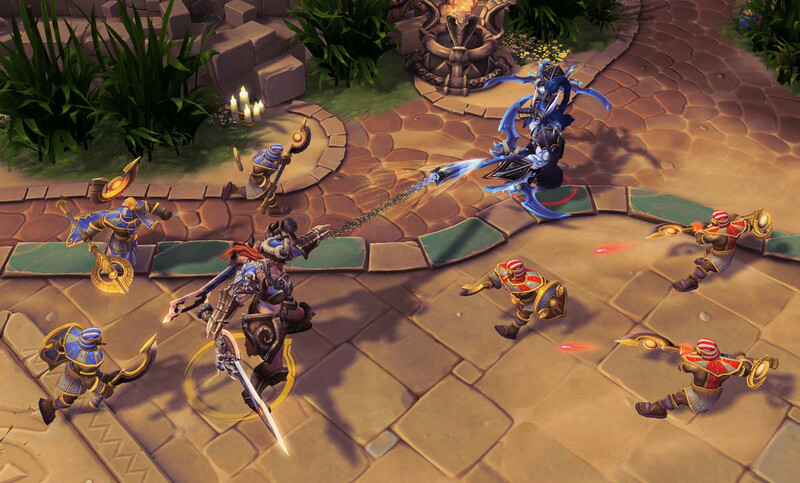 It took a long time to get here, we’re really happy with what we think of internally as Blizzard: The Game. It was community-built, and we’re excited to say this is this vision, the kick-off of something we’re really proud of. But ultimately, this is just the beginning of it, too.